Previous edition: 2008. Text on inside covers. 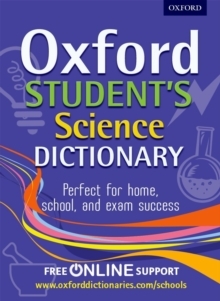 The Oxford Student's Science Dictionary supports the curriculum and gives comprehensive coverage of the key scientific terminology that students in secondary school need for GCSE and beyond. The dictionary contains over 1000 scientific words and phrases in alphabetical order, with related words listed under each headword. There are feature panels on key topics such as electricity, classification, metals, and the periodic table, all fully supported by2-colour diagrams and illustrations. Clear, accessible definitions and cross referencing give full clarity to complex scientific entries. It is the ideal companion to the Oxford Student's Mathematics Dictionary.